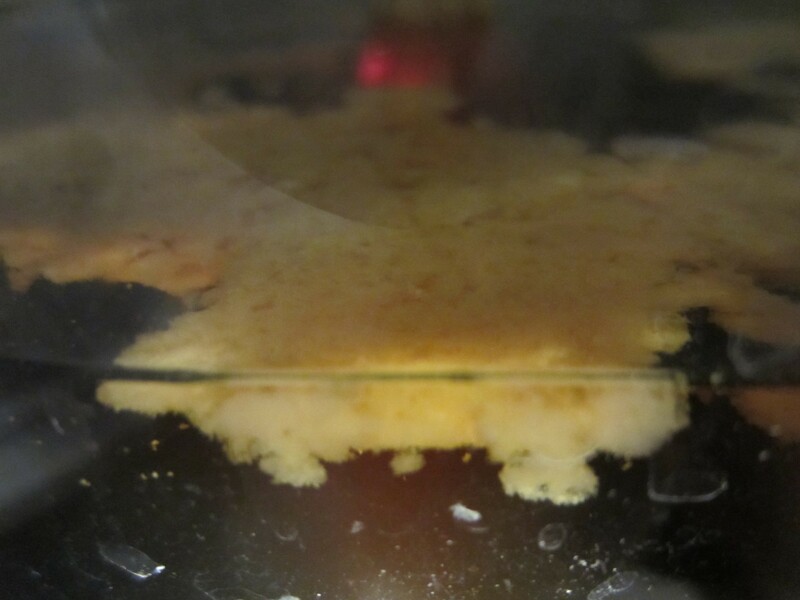 Yeast can be the most influential ingredient in beer, and many brewers often take special care to provide ideal conditions for their yeast in order to attempt to produce excellent beer and avoid certain yeast-derived off-flavors. 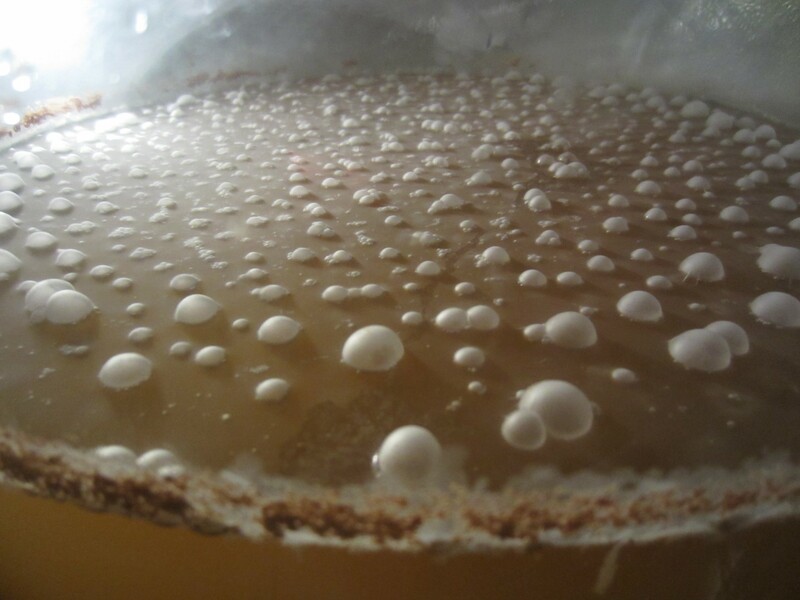 Likewise, brewers often concern themselves with pitching yeast prior to its “best before” date and also trying to ensure an appropriate yeast cell count for a given batch of wort. Curious as to how yeast beyond its “best before” date would perform, a 10 gallon batch of wort was brewed and split into two 5 gallon vessels, one batch was inoculated with one vial of yeast pitched prior to its “best before” date, and the other batch was pitched with the same variety of yeast that had exceeded its “best before” date by approximately 5 ½ years. 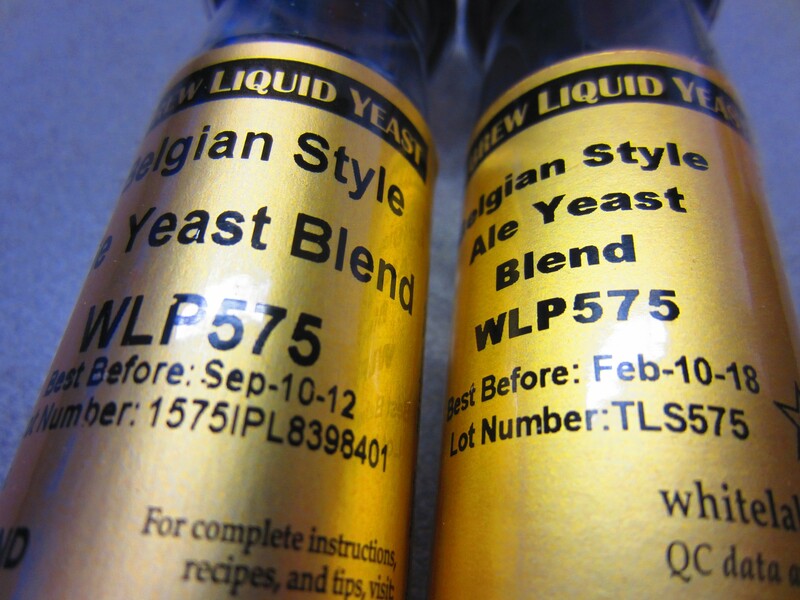 The particular yeast tested in this experiment was White Labs Belgian Style Ale Yeast Blend WLP 575, one vial with a “best before” date of Sep. 10th, 2012, and the other vial with a “best before” date of Feb. 10th, 2018. Both vials of yeast had been stored at approximately 37 °F (2.78 °C). 1. Can enough (or any) viable (live) yeast cells survive after being in a vial for nearly six years in order to ferment wort? 2. Assuming wort can be fermented with six-year-old yeast, will pitching the reduced amount of viable yeast affect the final character of the beer enough to be identified in a taste test when compared to a similar beer made with newer yeast and thus a higher pitching rate? Being that Belgian yeast is being tested, it seemed only fitting that a Belgian style wort should be brewed. 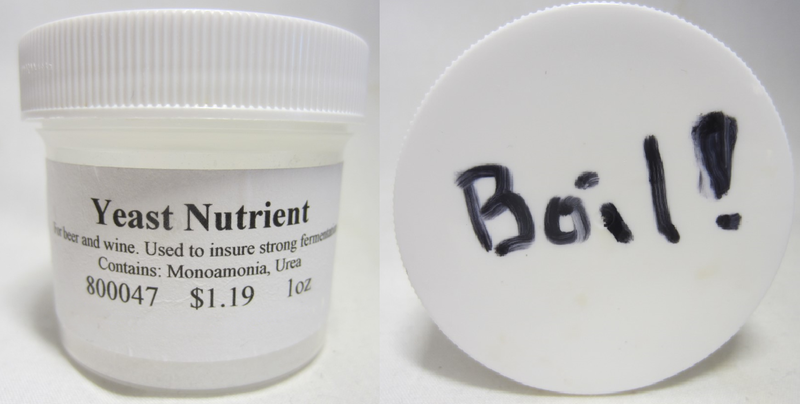 But what kind of Belgian wort would be best so as to minimize stress on the yeast and provide the best possible chance of growth, especially considering that the almost six-year-old vial of yeast might not have much if any viable yeast? After careful scientifical consideration, it was concluded that a Belgian Dark Strong ale recipe with a starting gravity of 1.116 would be a good testing ground for old yeast, because as Euclid’s 6th Postulate clearly states: “Go Big or Go Home.” Also, esters and other compounds which develop during the yeast’s growth phase may be more noticeable and therefore easier to detect in a beer of higher gravity that’s been fermented with under pitched Belgian yeast. 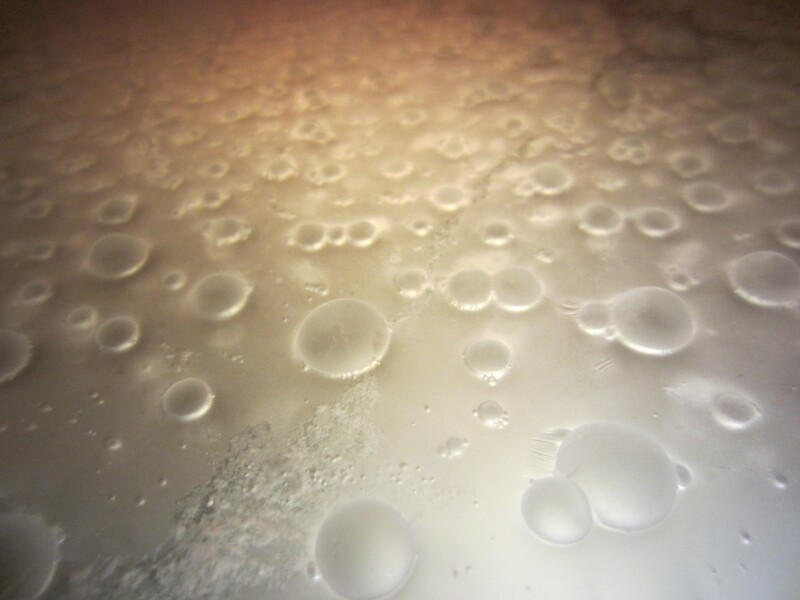 Of course there are some more serious dangers of under pitching yeast including the potential for other microorganisms to infect the beer, and the possibility of a stuck fermentation with the resulting under-attenuated beer. Not to be deterred, the next order of business was to determine what the potential viability of the yeast was based on its age, and also what an appropriate cell count estimate might be for a wort with a starting gravity of 1.116. Fortunately, online calculators have been designed for just this purpose. One such program is the Yeast Pitch Rate and Starter Calculator from the website www.brewersfriend.com where the tagline is “brewing with total confidence.” After entering the details of the age of the yeast and the starting gravity of the wort, the viability of the yeast in the vial was estimated to be at approximately 0%. In other words, the calculator reassuringly estimated that 0% of the yeast would be alive. Based on this figure, the program further suggested that the pitch rate of the old yeast would be just a tad bit short… by about 644 billion cells… which is to say we are under the recommended pitch rate by 100%. 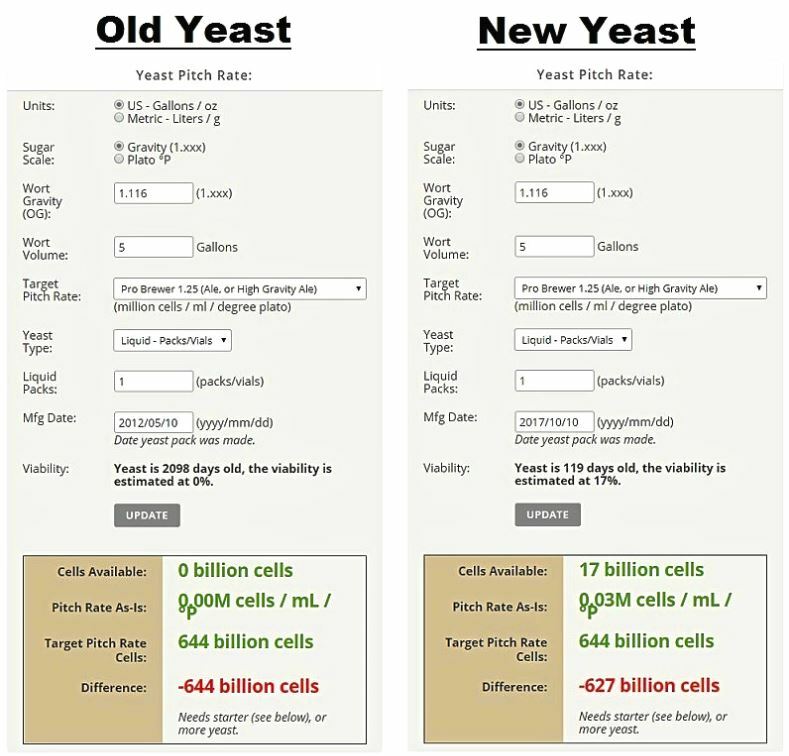 For good measure, the viability and suggested pitch rate for the new yeast was also calculated, and the program indicated that the viability of the yeast was about 17%, and thus the recommended pitch rate of the new yeast would be a little short as well, but only by 627 billion cells. 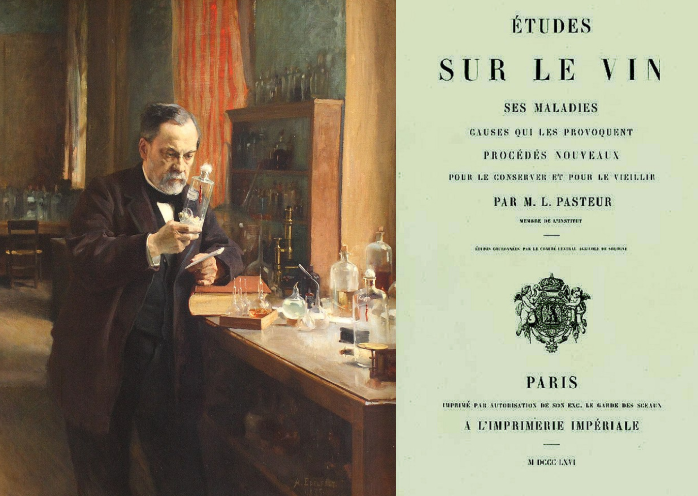 Armed with this information, the requisite “total confidence” was obtained in order to move forward with the experiment. In order to keep variables as consistent as possible, no yeast starters were made for either the old or new yeast. One 10 gallon batch of beer was brewed, chilled to 64 °F (17.78 °C), split into two vessels with one vessel receiving the new yeast, and the other vessel the old yeast, the vessels were shaken vigorously for one minute to oxygenate, and finally placed into a temperature controlled refrigerator set to 68 °F (20 °C) on January 29th, at 2:00 AM. 1. The old yeast might make beer. Or it might not. 2. The under pitched new yeast will probably make beer, but maybe it won’t. 1. Turns out that both predictions from above were correct! 2. The beer with one vial of new yeast began to form a krausen approximately 72 hours after inoculation. 3. The beer with one vial of 6 year-old-yeast began to form a krausen approximately 78 hours after inoculation. 4. Both the beer with the old yeast and new yeast exhibited vigorous fermentation and a similar-looking krausen, however the beer with the old yeast was more vigorous, pushing krausen through the airlock. 5. On day 8, airlock bubbling slowed dramatically, and by day 9, it had stopped. By day 10, the krausens of both beers had still not fallen. 6. A sniff check on day 9 revealed that the aroma of the beer with the new yeast was more fruity and complex, whereas the beer with the old yeast exhibited more of a generic overstated yeast character, and not as much of the complex fruity character typical of some strains of Belgian yeast. 7. A sniff check on day 10 revealed that the aroma of the beer with the new yeast maintained its same fruity complexity, but the beer with the old yeast had toned down some of its predominant generic yeast character, and begun to develop a more complex and better integrated yeast-to-beer balance. 1. The beer with one vial of new yeast will attenuate to within 5 gravity points of the beer with the old yeast, give or take 20 gravity points. 2. The two beers will be repeatedly distinguishable based on a triangle taste test performed by 10 supertasters (significance will be reached with a p-value of <0.05). However, a subsequent and more advanced trapezoid test will reveal that statistical significance was not reached by a population size of 20 non-supertasters. Welcome to the BJCP Entrance Exam Mock Practice Test presented to you by the good fellas at BeerSyndicate.com. The BJCP Entrance Exam Mock Practice Test is designed to better prepare you for the online BJCP Entrance Exam and to provide practical training using the Beer Style Compare-O-Matic, which is simply the most effective free resource for the actual exam. Both the difficulty of the questions and time limit on this practice test are very similar to the actual online BJCP Entrance Exam. However, the focus of this practice test is strictly related to knowledge of the 2015 BJCP Beer Style Guidelines, an area that makes up approximately 50-60% (or more) of the actual Entrance Exam. Just like on the actual online BJCP Entrance Exam, the questions on this practice test are either true-false, multiple-choice, or multiple-choice/multiple-answer. If you have not done so already, please review the How to Pass the Online BJCP Entrance Exam Tutorial to familiarize yourself with what you need to know to be successful on the exam over all. Hi, I’m Dan: Beer Editor for BeerSyndicate.com, Beer and Drinking Writer, Gold Medal-Winning Homebrewer, Beer Reviewer, AHA Member, Beer Judge, Beer Traveler, and Shameless Beer Promoter with a background in Philosophy and Business. Turns out this brewery was sitting on a formidable batch of American Barely Wine that hadn’t completely fermented out and as a result was unable to be sold. The brewery had tried all the standard tricks to get the beer un-stuck like pitching more yeast, raising the temperature of the fermentation tank, and other tips mentioned in the article How to Beat the Stuck Fermentation Monster, but nothing was working and they were left facing the very bleak reality of having to dump the entire batch. And big badass Barley Wines ain’t exactly cheap to make either. I asked if the brewery in question had ever thought about blending the under-attenuated beer with some other beer they had on stock (or could quickly whip up), to which the brewer replied, “Now there’s an idea.” We also talked about the possibility of pitching a cleaner variety of Brettanomyces (Brett) to break down some of the longer chain dextrin sugar molecules that typical Saccharomyces ale strains do not, thereby lowering the final gravity of the beer into a more palatable range. Of course there was concern about Brett getting loose in the brew house and infecting other beers because even though Brett is a yeast and not a lactic acid producing bacteria like Lactobacillus or Pediococcus, it is no ordinary yeast and can be noticeable in very small quantities in beer. Not to mention, there were worries about exactly what types of esters and other aromatic characteristics Brett might impart. Caution be damned: the brew house opted to execute Operation Brett. Three anxiety-ridden months later, I’m happy to report, the stuck fermentation was no more and the beer in question was flowing on tap and customers were throwing down a premium for a taste of this delicious imperial brew that narrowly escaped the drain. The beer itself wasn’t Brett-funky nor was it cloyingly sweet, but it lacked the pronounced hoppy character you might expect from an American Barley Wine, but by no means was it a drain-pourer. 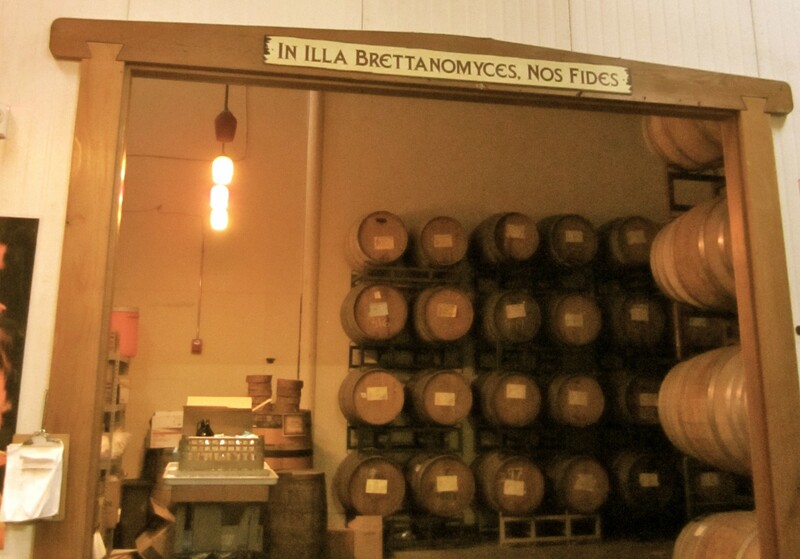 While some breweries shun potential beer spoilers like Brettanomyces, others like The Lost Abbey embrace it as noted on the plaque above their barrel room which states “In Illa Brettanomyces Nos Fides”, which translates roughly from Latin as “In the Wild Yeast We Believe”. Now, if you plan on calling Brett to the rescue in the case of a stuck fermentation at the home level, I would consider having at least a separate set of tubing when using Brett to help prevent cross-contamination, but to play it safe, a different set of plastic or vinyl equipment for any Brett or bacteria beer wouldn’t be a terrible idea either. 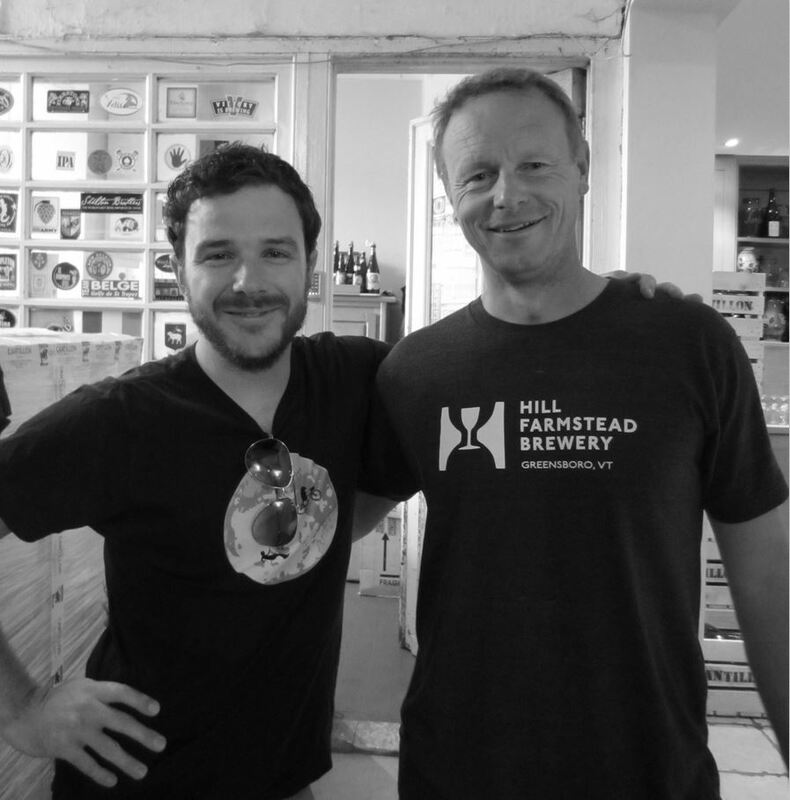 If working with Brett is a bit out of your comfort zone, you may be able to blend your way out of trouble too. The end goal or every blended beer may be different, but in the case of a stuck fermentation, it is usually to balance your overly sweet beer with a drier beer. It’s up to you whether you want to try and blend in a completely different style of finished beer or simply a more sessionable version of your under-attenuated one, but the key is to blend and measure small incremental amounts of the two (or more) beers together in a separate smaller vessel (like a measuring cup) and then to taste the blend at every incremental addition in order to obtain the proper ratios and desired flavor profile because the final ratio may not be a straight 50-50 blend. Ladies and gentlemen, for my final trick, I will demonstrate how to transform a meh beer into something, potentially, truly spectacular. Of course “meh” beers aren’t necessarily bad per se, but they’re not exactly all that great either, so in some cases, it pays to know a bit of brewer’s magic. In all cases below, we are essentially trying to mask some off-characteristic(s) of a less than stellar beer. Story time: Back in the summer of 2011, I brewed a Belgian Wit spiced with the typical combo of coriander and bitter Curaçao orange peel, but tweaked it by adding a touch of dried rose buds and Osmanthus flowers (which contribute notes of apricot and peach). The aroma wafting from the fermentor smelled like glorious success, but after sampling the beer post bottle conditioning, let’s just say, Hoegaarden it was not. Disappointed but not defeated, I thought, it being summer time and all, why not see about turning this brew into a shandy-type thing, i.e. beer mixed with lemonade, or some other citrusy juice— heck, even grapefruit juice would work. So I picked up a few gallons of quality premixed limeade, filtered out the pulp, dumped a couple gallons of limeade in the bottling bucket, popped the caps on about two gallons of the meh Wit beer, mixed it with the limeade, and bottled again. I figured there’d be enough yeast in the bottles to ferment the limeade, and I was right. Explosively so. Three days later, a bottle bomb went off. Luckily my shandy “exBEERiment” was packaged in closed beer boxes so tiny shards of glass didn’t find their way into my eyeballs, but I learned a valuable lesson that day: don’t add an unknown amount of sugar (in this case from the limeade) to your beer right before bottling. Once again, I popped the caps off all the bottles, poured all the shandys into a fermentor, and this time I waited a week or two until fermentation was complete before bottling for the third and final time. Will this trick work with all styles of beer? Maybe, maybe not. You may have heard of Vinnie Cilurzo of Russian River Brewing Co. who’s credited with inventing the style of beer known as Double IPA. True story: when Vinnie was brewing at the Blind Pig brewery prior to Russian River, he used to add copious amounts of hops to the brew in order to cover up possible off flavors that came from brewing with rather old brewing equipment. And thus the Double IPA was born. Yep, why not try hopifing your meh beer by laying down a dry-hop carpet bomb of your favorite hop combo. Simply call your redo-brew a hopped up, or “West Coast”, version of a fill-in-the-blank beer and legions of hop-obsessed super fans suffering from alpha acid numb-tongue will thank you. Measure out .25 ounces of Columbus, Centennial, and Simcoe for a total of .75 ounces, dry hop for 7-9 days, and then add a second round of the same amount and combination of hops for 5 more days. Coffeefication is similar to hopification in that you’re simply adding some amount of coffee (beans, grounds, or cold pressed coffee) to your less than great beer. Conveniently, you can add coffee to almost any style of beer, but usually less coffee is needed in lighter colored beers. Dry hopping with coffee beans (ground or whole) or adding cold brewed coffee to the beer will work, although some brewers prefer dry hopping with coffee beans so as not to dilute the beer with already brewed coffee. Not all coffee is the same, for example some coffee is more fruity, roasty, or chocolaty than others, so choose a kind that you think will mesh well with your beer. If dry hopping with coffee grounds or beans, figure 1-2 ounces per gallon of beer for darker beers, and .5-1 ounce for lighter beers for 48 hours (older beans work better to reduce the capsicum character). These amounts are general guidelines as brewers have reported success adding a wide range of differing amounts of coffee beans/grounds to their beer, so fortunately you have a wide margin of error here. On a side note, adding coffee beans to beer often has little impact to the color. This may add some extra wow-factor to a light colored coffee beer. For adding cold pressed coffee to a darker beer, a ratio of 12-32 ounces of cold pressed coffee per gallon of beer is a good rule of thumb. Of course, when adding cold pressed coffee to beer, it’s best to pull a sample of your existing beer, and slowly add pre-measured amounts of coffee to the beer to better determine the ratio that best suits your taste for the particular style. As always, no matter what style of beer you’re brewing, it’s best to rely on solid brewing practices like these so that you don’t need to resort to brewer’s magic. Not to mention, even the most potent brewer’s magic may not be able to save you from the foulest of brewing abominations. Nevertheless, the history of beer is replete with tales of happy accidents and certainly a little bit of brewer’s magic played a part in at least a few of the amazing beer styles available today. So with that I say cheers to the underdog brewers who had the audacity not to dump and were handsomely rewarded with something truly sublime. And cheers to those who tried anyways.